In general, I have tried to limit these blogs to England and particularly London. But, of course, during the reign of Queen Victoria, England, and therefore London, was the centre of one of the largest empires the world had ever known. Events that took place in the far-flung reaches of the Empire reverberated around the world and what could have had as profound an effect as a first Royal visit to Australia. Considering that it was barely more than a decade since a degree of self-government had been granted to the individual colonies (with the exception of Western Australia) and that the last convict ship had not yet arrived in Australia, a visit from a Royal Prince, one of Queen Victoria’s children, was a momentous event. This was to be even more the case when, much to the embarrassment of the colony of New South Wales, an attempt was made on the life of a Royal Prince. The story is too interesting to be told in only one blog. 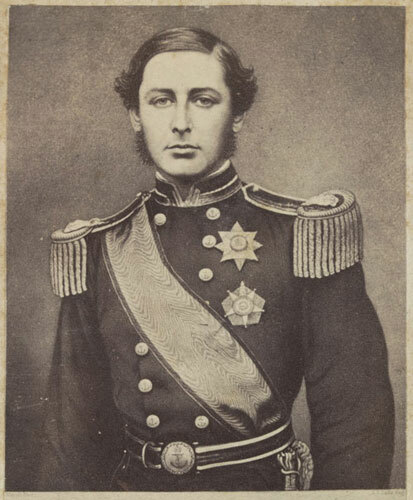 This is the first of a series of three that will discuss the 1867-68 visit of Prince Alfred Ernest Albert, the second son and the fourth child of Queen Victoria and second in line to the British throne. Born on 6 August 1844, at the time of his visit to Australia, he was intituled Duke of Edinburgh. Prince Alfred indicated, from an early age, that he wanted to enter the navy and in 1858, at the age of fourteen, having passed the midshipman’s examination he was appointed in that rank to HMS Euryalis. Over the next decade he rose through the ranks, being appointed Captain in 1866 and being given command of the newly refitted 26-gun wooden screw frigate HMS Galatea in 1867 for a world cruise. In February, after some time in the Mediterranean he departed for Brazil and a state visit with the Emperor of that country. This was followed by two months at the Cape, and on 31 October HMS Galatea, under the command of the 32-year-old Prince, arrived in Adelaide, South Australia. His six-month stay in Australia was to be both a triumph and a disaster frequently overlaid with elements of farce. were mean and tawdry, so it was said—unworthy of the city—unfit for the reception of a Prince; King William Street was likened to a rag fair, and every epithet exhaustive of condemnation was heaped upon them. Eventually the date of the departure from South Africa was confirmed and plans were made for the arrival of the Prince. Days passed but the ship did not arrive. Finally, on 27 October the signal guns rang out: bang, bang, fizz. The third of the three shots meant to herald the sighting of the ship provided a flash without a bang! Even so, the excitement was intense. Almost every one turned out into the streets, which wore a more lively and busier appearance than they had done for many a day previous. After wandering about for more than an hour in a most purposeless manner, irritated and excited by all kinds of contradictory rumours, they gradually dispersed with the unpleasant conviction that they had been hoaxed. Indeed, they had been hoaxed. But a few days later, when HMS Galatea actually did arrive, it was barely noticed as it slipped into Holdfast Bay. It was not until five excursionists from Adelaide rowed out the to ship that Glenelg, Adelaide and the newspapers were able to confirm that the Prince had arrived. But not all the monuments which bear the Prince’s name derive from such happy events. The Royal Prince Alfred Memorial Hospital in Sydney, was erected, as the name suggests, as a memorial and as a thanksgiving after the Prince survived an attempt on his life. So, what was Prince Alfred doing in Australia, where did he go, what kind of reception did he receive, how did the assassination attempt come about? And what, if any, were the ramifications of the attack? For more details on Prince Alfred’s stay in South Australia, download J. D. Woods, A Narrative of the Visit of H.R.H. The Duke of Edinburgh, K.G., to South Australia, by clicking here. J. D. Woods, A Narrative of the Visit of H.R.H. The Duke of Edinburgh, K.G., to South Australia (Adelaide, 1868), p. 4. “Laying the Foundation-Stone of Prince Alfred College,” South Australian Advertiser (6 November 1867), p. 2.